It has been about a month since the patch that Adept’s health from 80 to 70 had gone live. There are some interesting changes to the metagame so far. Two potential changes were proposed in the prior comunity update discussion. One increases the shade cooldown, and the other decreases the health. That is, the former nerfs Adept’s shade mobility which is more targeted for PvZ, and the latter nerfs Adept’s stats in a battle which is more targeted for PvT. In the end, Blizzard picked the health nerf, so the Terran versus Protoss match up is expected to be affected. The rationale behind this change could be traced back to the prominence of the Adept Phoenix composition in the match up. In short, Adept is considered to be too cost efficient, and Blizzard decide to intervene by reducing the health of Adept. I know there are more changes in the most recent patch, and I will get to that later. Since the change is meant to target the cost efficiency of Adept (especially with Adept Phoenix), it makes sense to see if Adept Phoenix has dropped out of fashion after the change. Below are the TvP games of the current Ro32 GSL, and the time frame is right after the Adept nerf. Clearly, I can collect and present more data, but I’m lazy and it is enough to show the pattern. I excluded those weird games in the chart below. Adept Phoenix still remains the most popular PvT build after the change. More importantly, there is a good range of builds in the current metagame that changes the seemingly dichotomous nature of the match up. The match up was rather dichotomous, whereby Protoss either go for Adept Phoenix or Robotic Facility tech path. You often hear people say things like, Protoss either go for Adept Phoenix, or Robotic Facility and Twilight Council. Terran, then react with the following, by playing defensively against Adept Phoenix, or by playing offensively against Robotic Facility builds with Widow Mine drops and Siege Tank Stim timing . This basic understanding of the match up sets the foundation of the match up, and this either-or nature of it is not exactly appealing from various perspectives. Therefore, the current distribution shows the metagame is moving away from the dichotomy to a more diverse set of builds. In fact, the dichotomy metagame is being used as a mind game in the match up. Based on the above settings, Terran would plan two basic sets of game plan to deal with the two mainstream Protoss tech paths, and it is important to scout which path Protoss is going for. In the vod below, herO cancelled his Stargate to build a Robotic Facility and Twilight Council after MajOr had scouted the Stargate early on. With the inaccurate information that herO is going for Stargate, MajOr opt for a Viking from his Starport as a metagame response. 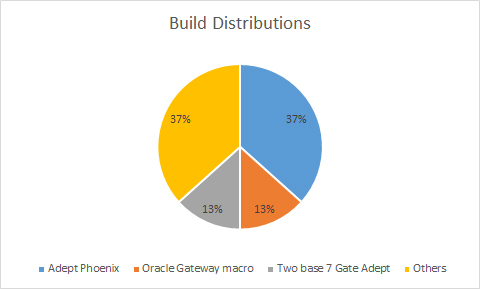 Oracle into Gateway macro is another popular macro build, and this means a standard Stargate opening can branch out to either an Adept Phoenix build or an Oracle Gateway build. The Oracle Gateway build is essentially a delayed Robotic Facility and Twilight Council tech path build that opens up with a Stargate for two Oracles (usually two), and hence, Terran can use the Siege Tank push against it well. The straightforward logical way to figure out which one it is from Terran’s perspective is simply to look for the Phoenix, such that it is not Adept Phoenix if there is no Phoenix. This logical train of thought is also used as a mind game in recent games, see the vod below. In the vod above, Classic was using Adept Phoenix, but he only showed two Oracles and hid all his Phoenix. This gave TY the wrong impression that he was going for Oracle Gateway build, and TY did a reasonable response by going for a Siege Tank timing. This move was one of the main reasons why Classic won that game so decisively as TY was not playing the “right” response. There are some other interesting changes that some Protoss players have been exploring this past month for Adept Phoenix. One is to mix in Sentry into the composition, and the rationale is to utilise Sentry’s Guardian Shield to compensate Adept’s health nerf. The vod below is an example of that. However, based on more recent games, it appears that this is considered not to be a good idea. In my opinion, I think the inclusion of Sentry restricts the mobility of the Adept too much to have a good engagement initiation that the additional armor does not seem worthwhile. The other interesting change to the Adept Phoenix build is to emphasize more on Gateway production in the midgame, then have double Robotic Facility production later to tech switch to Colossus quickly. This is a very common path that Protoss players take when they go for Adept Phoenix. As I have also mentioned in my first post about Adept Phoenix three months ago that Terran should not be aggressive against Adept Phoenix, and it is the major mistake that Terran players made for the past months. Now, Terran players have figured this out, and do not fall into the trap. Thus, Protoss no longer win with just Adept Phoenix, and they have to transition out to a more cost efficient composition in the late game. Below vods are some examples (timestamped at double Colossus production). In an old post in January, when Adept Phoenix was yet discovered, I mentioned Protoss were adapting to the Siege Tank timing by going for two base Colossus before taking a third Nexus. I also said that it was not that good of a build, because you are being defensive without exactly leveraging it. You almost never see this build once Adept Phoenix was discovered, and I have only seen once in GSL Ro32. However, Classic, who is currently on a great PvT form, has shown an interesting variation of this build. He went for a Disruptor drop before he started his Colossus production. I was a little surprised that he put down quite a number of Gateways before he took his third Nexus though. The latest patch had buff Zealot’s charge upgrade by decreasing its cost from 200/200 to 100/100. It is quite convincing to me that the upgrade is still a mid/late game upgrade, and Blink or Glaives should have higher priority in early/mid game. Zealot is just inferior to Adept in the early and mid game, and Zealot with charge is extremely hard to use for defence. The vod below shows exactly that. If you were to get charge early, it should be used for a timing attack. In Heart of the Swarm, Archon and Charge Zealot mid game timing was quite successful, but Adept just seems a lot more versatile in Legacy of the Void. You can simply do a two base seven Gateways all-in for the same purpose, and it is better for transition and harassment (also less risky). Classic has been getting Charge upgrade as part of his late game composition switch, and he replaces his Adepts with Zealots once the upgrade is completed. Fully upgraded Charge Zealot is still my most hated unit in Heart of the Swarm. They force Terran to spend a lot of apm on kiting, and they serve the purpose of meat shield for the Colossus and Archon at the back better than Adepts. See vods below. The first vod is timestamped at the point where you can see Classic have Zealots and no Adepts. The second vod is so good that you should watch the whole thing. I won’t post Metagame Build Order for May 2017, because there is nothing interesting to talk about.